As I have charted through the economic or political or ecological visions of the future that underlie all these ed reforms, I keep mentioning the lack of knowledge. The insistence that being able to search for information with a search engine is enough. That it no longer needs to be either in a student’s brain or a conceptual remnant, developed by the student from facts that passed through of how the world worked. What had led to tragedies in the past. What character traits worked well. What acceleration towards a personal abyss always felt like and what tends to provoke it. 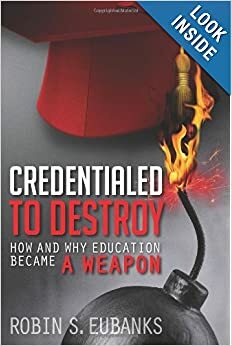 The fact that education at all levels, K-12 and higher ed, plans to largely take that away under accreditation mandates or visions of equity that require only curricula ALL can engage in (even if it’s as a member of the group with project or problem-based learning) is so counter-intuitive to each of our experiences of what works. And what will not. So I wanted to spend some time today quoting these no knowledge aspirations. I am really not kidding. Or exaggerating. Or going to great trouble to locate a juicy nugget to get you outraged to take action. Every once in a while only a nerdy, 10 dollar word will do and here comes one—omnipresent. This essential component of the vision of the future is everywhere in these sources. It goes back decades. And it is integral to the vision. As my readers who read the Climate Skeptics sites like Jo Nova or Watts Up With That or Bishop Hill all know, yesterday the remainder of the ClimateGate emails as well as the password were released,. As we await those revelations of additional coordination to prevent reality from intruding on lucrative grants and false models intended to guide public policy, let’s think about the determination to shut down unapproved knowledge itself. This post was already outlined when that wonderful news came out yesterday. But the facts in this post just became more important. That’s true of Hollywood and the nightly news but it is especially true in an education world both trying to deemphasize factual knowledge AND come up with the filtering metaphors that students will come to see the world through without appreciating they are metaphors and not reality itself. We know Don Schon saw this and loved its possibilities for social change with just the right Generative Metaphors. We have seen it with Bronfenbrenner’s Ecological Systems Theory now being taught as fact to both teachers and students. Harvard Professor AN Whitehead even came up with a name for it–“the fallacy of misplaced concreteness.” Now instead of a warning, that fallacy is being deliberately cultivated as a key, politically useful component of desired 21st century thinking. But which is more likely to lead to actual destruction in the 21st century? Jettisoning the accumulated knowledge of the past for political theories of what might work? Psychological theories of how human nature might change if education becomes more visual and group-oriented and grounded in social and emotional learning of new values daily in the classroom? And virtually none of these underlying assumptions driving ed reforms globally are on anyone’s radar. Except mine and now yours. I feel a bit like Mr FOIA of ClimateGate. This is too grave to be allowed to stand without at least trying to stop it by bringing it to your attention. Done. Time for breakfast and the carpool line.